Vote for me in the Valentines Showcase this is my entry. I am number 42 on the list. 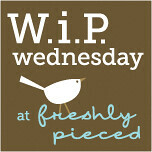 OK this is my second WIP so I am looking at Freshly Pieced listing for some good advice. Man Quilts 2-3 more like Dad's Zag Zag and Paisley Parade I have enough X's sewed for 2 and half of these. Tosha's Quilt (wife's sister) this is being mostly worked on by my wife. This is now sewn together just waiting for wife to finish cutting it. The flannel on the back will be the same as which is on Hearts and Flowers 2 Hum never took a picture of the back of that quilt interesting. Biggest change for this week Is that I have started on my Granny Square quilt I really love these blocks. 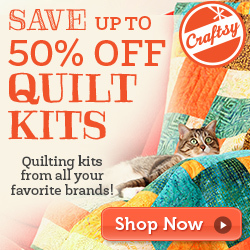 wow - your house is aflurry with quilting! Lots of fun projects! holy cow- you've got quite the list going! Did you see that they're starting a Granny Square quilt along March 1st over at Old Red Barn Co.? I'm thinking about quilting along this time. Everything looks great! So many projects in hands. how can you deal with it. Love the heart's quilt. Good for you for having some finishes! Cool Granny block! I love that you and your wife both quilt! Lots of great projects in the works! I like your granny square block!